Riverside Regional Jail’s visiting area is a place for families, friends, and children. Attire should be appropriate to this setting. Visitors may wear casual clothing that is reasonable and appropriate. Riverside Regional Jail reserves the right to refuse admittance of any visitor that does not meet the jail’s dress code standards. Any visitor whose attire is considered inappropriate will be denied their visit. On this page, you will find guidelines as to what the jail deems appropriate dress and behavior for visitors. 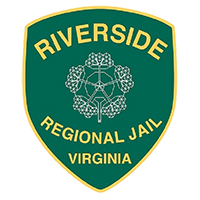 All inmate visitations are scheduled online at our visitation portal. All visits will start and end on time unless the visit is terminated for cause. Visitors are encouraged to arrive at least 15 minutes prior to the start time of the scheduled inmate visitation. If a visitor arrives more than 15 minutes late for a regular scheduled visit, the visitor will be denied the visit. Any visitor who is disruptive or argumentative with staff, or creates a disturbance in the Lobby or the Visitation area, will be asked to leave the facility and may be prohibited from future visits. The phones provided in visitation must be utilized at all times. Failure to do so will result in your visits being terminated and future visits will be denied. All items will be removed from pockets, and each individual will pass through a walk-trough metal detector. An Officer will also scan you with a hand-held metal detector. There will be no more than five (5) visitors per one inmate at any given time in the visiting area. No more than three (3) of the five (5) will be minors. Intoxicated visitors or visitors who appear to be under the influence will be denied access to the facility and may be subject to arrest. A parent, legal guardian, or responsible adult must accompany any minor child under age 18 who is listed on the scheduled visit. All visitors, with the exception of minors, will have a valid Federal, State, or Passport identification that includes a picture and date of birth. Visitors without proper identification will not be permitted to visit an inmate. Visitors are permitted to visit only the inmate they have scheduled to visit with. No bare feet. Visitors are required to have footwear on at all times. All visitors (male and female) are required to wear undergarments. Females are required to wear bras. Wear clothing that is appropriate for a large gathering of men, women, and children. Wearing inappropriate clothing (such as provocative or revealing clothes) may result in you being denied visitation. No visitor will smoke, drink, or eat while in the visitation area. No visitor will flash or make obscene gestures while in the visitation area. All visitors will refrain from using profanity during the visitation, as this may be disrespectful to others who are visiting. If caught using profanity, your visit will be terminated and future visits could be suspended. All children will remain under constant supervision and control while visiting. No minor under age 18 will be left unattended at anytime in the visitation and lobby areas or in a vehicle in the parking lot. No child will be allowed to jump, climb, run freely, or play in the visitation lobby area. One diaper and one bottle for infants, no bags allowed. If strollers are necessary, they will be searched. Prescription medication for inmates can be brought to the jail with prior approval by our medical staff. A nurse will take medications once approved. No over the counter medication is accepted. Clothing for court, if prior approval has been made, will be accepted at the lobby desk by the Property Officer. Property is only accepted Monday through Friday from 0800 hrs to 1600 hrs. Kiosk machines for cash deposits and credit cards are located in the lobby of the main jail and Pre-Release Center. Money orders or certified checks are also accepted. Visitors should limit items brought into the jail during visitation. The following items are not permitted in the visitation area, or any part of the jail and should be left in your vehicle. No cigarettes, vapors, tobacco products, lighters, and/or matches. Any items considered to be a weapon, such as knives, kubatons, etc. Photo/Video cameras and/or recording devices. Do not bring the inmate letters, pictures, magazines, or books. Do not bring pocketbooks or handbags, toys or coloring books, etc. Note this list is not all-inclusive, other items may be deemed inappropriate by the Watch Commander. Any visitor who brings or attempts to bring drugs, alcohol, weapons, or other prohibited items into the facility will be prosecuted. If a fire alarm sounds during visitation, you will be directed to evacuate the facility immediately. It is of utmost importance that you follow the Officer’s instructions. Notify staff of unusual situations or situations of concern, such as if you have a disagreement in visitation with an inmate, or if you are delivering bad news to the inmate during visitation. 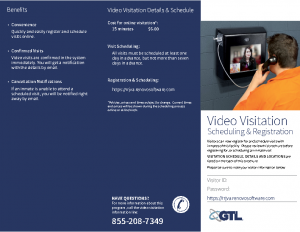 Visitors are asked to notify staff of situations in which they may have concern with safety or security, such as water spills or restroom facilities that are not working properly. Visitors are not to attempt to communicate with an inmate when entering or exiting the facility. Visitors will not loiter in the parking lot or on the premises. Do not litter. Please use trash receptacles accordingly. Smoking is limited to the parking lot area only. No smoking on the walkway, the stairs leading into the facility or inside of the facility. This includes e-cigarettes. Visitors are to park on the right side of the parking lot (facing the facility), which is designated for visitor parking. All children must remain with an adult visitor at all times while either in the Lobby or the Visitation area. If children are disruptive during the visitation, you will be asked to leave. Note: All rules included on this page are general. Further instructions by staff must be followed at all times. Any visitor who violates the jail’s rules and regulations may have their visitation immediately terminated. This action may restrict you from future visitation privileges.